Classy 5' 9" tall goalscoring midfielder born in Camberwell, London who was also a penalty expert. Vic started his career as a junior at Crystal Palace in the late 1960's and progressed to the Eagles' reserve team. During the period 1970/71-1973/74 he made a total of 103 reserve team appearances and scored 20 goals. Vic played once for Palace's first team - in a 3-1 home win over Lazio in an Anglo-Italian Cup tie on 4.4.73. He was also an unused substitute for a first team game at Liverpool and played for Palace in a 4-3 win at Ramsgate on 8.5.72. The game was a testimonial for Rams players Dave Huddart and Mick Williamson. In the summer of 1974 Vic joined Margate and made his debut as a right winger in a 2-1 win at Guildford & Dorking on 17.8.74, the opening day of the 1974/75 season. He went on to make a total of 36 appearances, five of them as a substitute, and scored six goals. The first of them was a deft lob in a 3-0 win over Grantham at Hartsdown on 17.9.74. Vic also found the net with a tremendous volley from the edge of the penalty area in a 1-1 draw against Atherstone on 8.4.75 - a strike that the Thanet Times described as "a gem of a goal". Although he was in and out of the side during the season Vic was described by the local press as a "livewire" and was said to be "stylish" with "flair in plenty". During the 1975/76 campaign Vic really established himself and made 54 appearances (three as sub), usually playing on the right wing. 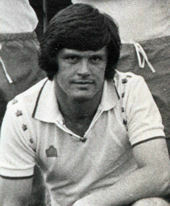 His accurate crosses provided a stream of chances for the likes of Brian Gregory and he also scored ten goals himself. Two of his goals came during a 4-0 win over Dover at Hartsdown Park in a Kent Floodlight Trophy tie on 24.2.76 and the Isle of Thanet Gazette said that he "really turned it on". The report also said Vic "appeared to turn inside out" in a crowded penalty area to find space to fire home one of his goals. He also scored an excellent solo goal in a 1-1 home draw with Dover on 16.4.76, speeding past three players before slotting home. On 22.4.76 Vic played as Margate won 2-0 at Canterbury in the 1st Leg of the Kent Floodlight Trophy Final and he also featured in the 2nd Leg at Hartsdown Park on 24.4.76 which the visitors won 2-1 after extra time. The result meant Margate took the trophy with a 3-2 aggregate win. Vic made a further 43 appearances (four as sub) during the 1976/77 season and was described as being "effervescent" by the local press. His five goals included a cheeky lob from fully 40 yards in a 5-1 defeat at home to Minehead on 10.5.77 and shortly afterwards Margate's relegation from the Southern League Premier Division was confirmed. The 1977/78 campaign was an excellent one for Vic as he scored 20 goals from 46 appearances (one as sub) to finish the season as the club's joint leading marksman, sharing the honour with Ray Summers. Vic also won the 'Player of the Year' award after turning in a string of excellent performances. The Thanet Times said that he was "probably the most capable winger in Division 1 of the Southern League" and added that he was "sometimes two moves ahead of his colleagues". The paper also praised Vic's "immaculate control" and "enterprising runs" whilst describing him as being "the ace in the pack" and "quick thinking and fleet of foot". Vic's goals included a clever lob from a difficult angle in a 6-0 home win over Romford on 22.10.77 and a brilliant 30 yard chip in a 3-0 win at Hounslow on 10.12.77. He also found the net with a direct free-kick in a 4-0 win over Bognor Regis on 31.12.77, scored a hat-trick in a 5-0 win over Crawley at Hartsdown Park on 28.2.78 and converted all four of the penalties he took during the season as Margate won the Southern League 1st Division (South) title. The 1978/79 campaign saw Vic make 47 appearances (four as a substitute) to take his overall tally for the club past the 200 mark. He scored eight goals, the best of them a long range effort in a 3-1 win over Dorchester on 12.3.79 that the Isle of Thanet Gazette called "a real ace". However not everything went Vic's way during the season. On 21.8.78 he had an argument with manager Dennis Hunt during the half-time interval of a home game against Dartford and as a result he was immediately substituted. Then on 18.4.79 Vic made an error that led to a goal for Cheltenham that was memorably described as being "the sort of back-pass that would even have earned a caustic comment in a kick-about on Marine Sands" by the Isle of Thanet Gazette. Vic began the 1979/80 season in good form and on 20.10.79 he scored with a rising shot to clinch a 1-0 win over Chatham. The Thanet Times said it was "a magic moment of typical Vic Pain mesmerism". The same paper also described Vic as displaying "measured thinking" and "pin-point passing". In addition the Isle of Thanet Gazette said that he was "always a tricky customer to handle" and had "the rare knack of being able to turn a game with a solo goal reminiscent of Phil Amato". Vic was troubled by several minor injuries during the season and in February 1980 he asked for a transfer, shortly after he'd received a tankard from the club to mark his 250th appearance. Manager Terry Morris said at the time "naturally we will want a fee for him because he is a player of genuine talent" and added "he has proved an excellent servant to Margate and I am sure he will do the same at his next club." In March 1980 Vic joined Gravesend & Northfleet on loan for the remainder of the campaign having scored five goals in 30 appearances. However he only started one game for the Fleet's first team, scoring in a 2-0 win at Redditch, and made two substitute appearances. The rest of his time at Stonebridge Road was spent in Gravesend's reserves and Vic scored six times in seven games for them. At the end of the season he returned to Margate. Having resolved his differences with the club Vic began the 1980/81 campaign in fine form and he was described as being "razor-sharp" by the local press. On 16.9.80 he scored what the Isle of Thanet Gazette described as "a magnificent solo goal" in a 4-3 win at Sittingbourne. Vic beat three players in a jinking run before firing home with his left foot. The Thanet Times said that Vic had "an inspiring game" at Dunstable on 25.10.80 and on 6.12.80 he scored from fully 25 yards in a 3-2 win over Gosport at Hartsdown. He then scored a hat-trick in a 4-1 win over Andover at Hartsdown on 20.12.80 and Vic's treble included a superb header. By February 1981 Vic had scored 14 goals and when he played in the home game with Bognor Regis on 7.2.81 it was his 40th appearance of the season. It turned out to be his last for the club. 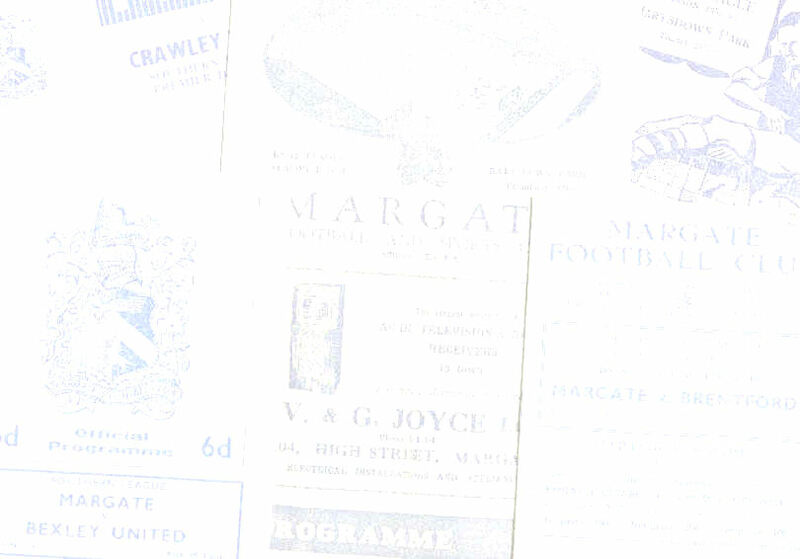 A few days later Vic joined Tonbridge and thus ended a six and a half year stay with Margate. The local press said that Vic left due to the club's desperate cost-cutting measures. However in March 2002 Vic himself said that although his wages at Margate had been cut by 30% he actually departed because he'd moved from London (where he'd lived throughout his time with Margate) to a place just 20 minutes from Tonbridge. Money wasn't an issue as Vic was only £5 a week better off with his new club and another factor in his decision to join Tonbridge was that he knew Tonbridge boss Tony Burns from his time at Crystal Palace. On 29.8.81 Vic scored twice for the Angels in a 2-1 win over Thanet at Hartsdown, one coming direct from a corner, and the Thanet Times said that he "performed a triumphant jig after each of his goals, much to the consternation of the Thanet crowd". The match report went on to say that when Vic "went off on his lap of honour...that was probably the furthest he ran in 90 minutes" and added "Tonbridge seemed to be using him like an American Football kicker, who appears only to 'convert' the touchdown". He spent 15 months with Tonbridge, playing in five different positions including right-back and sweeper, before work commitments took him to Hertfordshire in May 1982. He'd scored ten goals during the 1981/82 campaign. Vic had also fallen out with the Tonbridge manager after losing the captaincy. In October 1982 he joined Isthmian League Letchworth Garden City. Vic made 68 appearances for them up to May 1984 and scored nine times, he played mainly as a sweeper by that time. He then spent six months working in Germany. After returning to England Vic spent two and a half seasons playing for Bedfordshire club Biggleswade before moving to Surrey in 1987. He then had a spell out of the game until joining Cranleigh in the Combined Counties League in January 1989. Vic stayed with them for over five years and played mainly for their reserves although he also made 38 first team appearances, scoring two goals, before in May 1994 a knee injury brought an end to his career aged 41. After his career ended Vic discovered that he'd been suffering from the effects of being exposed to asbestos since approximately 1976 - during his spell with Margate. He realised that must have affected his performances over the years without him knowing, although in later years he'd noticed his stamina diminishing - something he'd attributed to his age. In March 2002 Vic was still playing the odd 5-a-side game and watched Margate play at Woking during the 2000/01 and 2001/02 seasons. A programme article during the 1978/79 campaign revealed that Vic's favourite TV programme at the time was 'The Two Ronnies' and that his favourite player was Trevor Brooking. Vic sadly died on 16.5.04 after a brave battle with cancer. He was just 51 years-old. Vic completed a questionnaire for this site which you can see here. Played in Southern League Cup Final 2nd Leg (12.04.75 - drew 1-1 at Kettering Town). Played in Kent Floodlight Trophy Final 1st Leg (22.04.76 - won 2-0 at Canterbury City). Played in Kent Floodlight Trophy Final 2nd Leg (24.04.76 - lost 2-1 to Canterbury City at home). Margate relegated to Southern League First Division (South). Margate promoted to Southern League Premier Division. Margate moved to new Southern League Southern Division following reorganisation of Southern League.